Categories: Business, Keiron Sparrowhawk, Self-help. The health of our brain, as measured through cognitive health domains such as “executive function”, is the single most important aspect of our overall health. In business, good cognitive health enables you to go beyond simply coping, to managing and leading. For a fully functioning brain enables us to operate to our highest capacity and reach optimum performance. Improved cognitive health allows us to become sharp, accurate, confident, precise, attentive, a source of wisdom and a bundle of energy. This book provides a comprehensive overview of the key cognitive health domains and how they impact your ability to operate at your best. You will understand the importance of each domain in order for you to maximize your cognitive health and be your best – or to have the best executive function. The ultimate guide to understanding your cognition – and how to enhance your business performance. ● The book draws upon the most recent findings and thinking in the area of cognitive health. 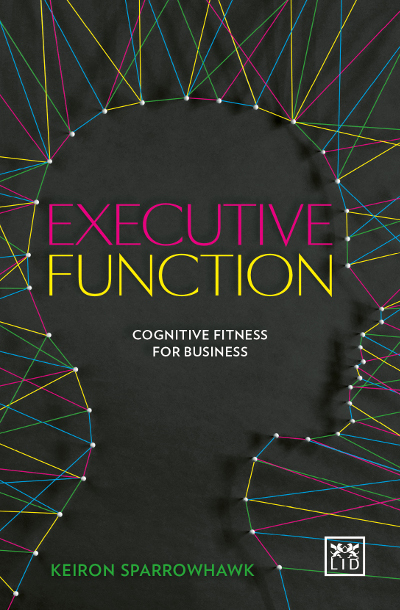 ● Drawing on 200 years of physicological research to understand key domains of congnitve health – especially “executive function”, the key to business success. ● Contains 50 practical tips and exercises to help improve your congnition and executive function. ● A breakthrough book for managers and businesspeople of all levels who are seeking greater performance. Portrait of Keiron Sparrowhawk photographed for Professional Manager magazine.